To play Holocaust survivor Wladyslaw Szpilman in the The Pianist, actor Adrien Brody learned how to play piano, practicing for four hours a day. He also gave up his apartment, sold his car and drifted around Europe so that he could identify with Szpilman’s isolation. To write a memorable character, I think authors have to be just as willing to lose themselves in their protagonists. A main character’s actions and words, the way he or she handles problems and the thoughts that run through his or her head, can’t be a thinly veiled version of the author’s own responses and musings. Authors must become “method” writers. 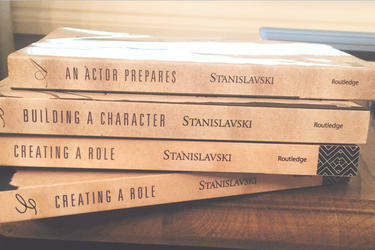 The Method was developed by famous acting teacher Constantin Stanislavski. It’s a way of getting into character that involves an actor doing things in his own life to allow greater identification with a part. Actors playing dancers learn to dance. 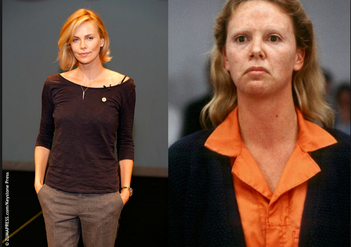 Charlize Theron gained a bunch of weight and changed her appearance for Monster to get into the head of her hard living, serial killer character. Nicholas Cage walked around the street in facial bandages to understand how isolating those kind of wounds can be to get into his wounded veteran character in Birdy. I tried to employ the method with my first book, Dark Turns. My protagonist was an injured ballerina who takes a gig teaching at a ritzy private school in order to heal and get some distance from a bad breakup. Best laid plans blow up when she discovers a body on campus her first day. I took ballet for over a year to get into my character, Nia Washington’s, head. I had never danced–unless you counted calypso and grinding to reggae music at parties. To write her, I needed to do more than imagine myself as in my early twenties and feeling bummed from a breakup (that part didn’t require much research). I had to understand what it was like for a person to push themselves physically to the point of pain for a goal. How does doing that change who someone is and how they respond to things? How does a hyper-awareness of your own muscles alter how you respond to physical stimuli? Nia, as a result, is hypersensitive to body language. She picks up on things about relationships in the way people move, how close they stand to one another, whether their weight is inclined towards a person or moving away, that inform how she goes about solving the mystery. She also misses clues that I’d never miss as a much more cynical, thirty-something ex-journalist who spent most of her professional life examining the things people said and their motivations for doing so. Obviously, in a year, I didn’t become a ballerina. Three classes a week and I was barely standing like a dancer by the end. But, I did get a taste of performing on stage and a small sense of Nia’s world: the nearly myopic focus she had to have for much of her life and the reactions she would have as a result. For my second book, the protagonist, Ana, is a thirty-one-year-old mom facing extreme financial stress after her husband loses his job. The mom part wasn’t a stretch for me, but the financial pressures were more difficult to picture. While I could imagine how I’d feel if my house was underwater and there wasn’t enough income coming in for the mortgage, I’d never had the stress of being unable to pay a bill. (I’d worked since sophomore year of high school and had been afraid of debt) So, for a few weeks, I gave myself a taste of that stress. I stopped using my credit card and tried to live on twenty percent of my usual amount. I didn’t, I’ll admit, stop sending my kids to activities–mommy’s dedication shouldn’t impact their life like that. But I did change how I grocery shopped, stopped entertaining, and tried to go through multiple days without spending a dime. It was extremely difficult. Some writers can get away with not using The Method because they have personally had a life that makes for good storytelling. My friend Brian Thiem is a 25-year-veteran of the Oakland Police Department who retired as commander of the homicide department. He writes about a homicide detective who confronts cases reminiscent of the worst ones he faced on the force. Brian’s background is interesting enough to serve as fodder for a compelling series character. He doesn’t have to get into the head of a homicide detective. That’s who he is. For relatively boring me, though, I need the method to help create richer main characters. To create villains or unreliable narrators who may do worse things than I could ever try out with the method, I use another acting trick called substitution. But that’s for another post.